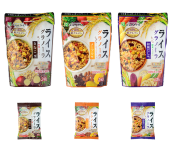 Rice Granola made with 100% Japanese rice - Murase Inc.
We manufacturer and sell agricultural products such as rice and rice processed products, sells rice, wheat, and also manages restaurants for enjoy our products. 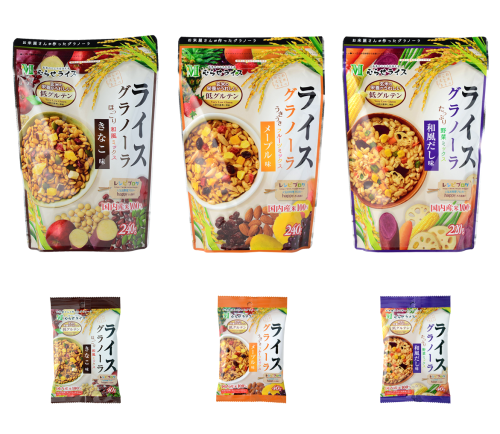 We’ve just started to expand the Rice Granola products to overseas, and we want to offer delicious taste as well as being good for your health. We used 100% Japanese rice (brown rice) grown in Japanese soil because we are “Murase”, a rice seller. You can enjoy softness unique to rice. We prioritized a delicious texture by carefully baking two kinds of puffs and oats. We do not use wheat, barley, rye as raw materials. This is a low-gluten food that is friendly to the body that complies with European standards (Very Low Gluten). * Food with a low content of “gluten”, a type of protein contained in wheat, rye, barley, etc. This product is manufactured at the same facility that creates products including wheat. Perfect for breakfast or for a snack! Choose your favorite from 3 kinds of flavors. Included azuki beans and sweet potatoes etc. in a well-balanced manner. You can eat it with milk, soy milk, or yogurt, and of course, enjoy it as it is. Perfect for using it also as toppings for ice cream, etc. This product is manufactured at the same facility that creates products including milk and wheat. Shelf life: 12 months. Included dried fruits and nuts in a well-balanced manner. You can eat it with milk, soy milk, or yogurt, and of course, enjoy it as it is. Perfect for using it also as toppings for caramel puddings, etc. Included purple sweet potatoes and green beans, etc. in a well-balanced manner. You can pour hot water or Japanese tea over it and eat it like a Japanese “Ochazuke”, and of course, enjoy it as it is. Perfect for using it also as toppings for salads, etc. Dietary supplement “Spirulina” and “Organic Germanium” – Japan Algae Co., Ltd.